Evolution calling….aquatic apes and religious chimps…..
Atavism is a term to describe usually biological attributes which have no modern day function but are still if only partially, present as so-called ‘evolutionary throwbacks’. These ” traits such as ear wiggling, the appendix, the tail bone and even the ‘goosebump‘ response are all examples of such historical atavistic mechanisms that give us an insight into our past….. But what about behaviour? To what extent are our current behavioural responses’atavistic’? How much of our ‘instinctual behaviours’ determined from our evolutionary past? The stress response is one of the most researched in terms of the ‘fight or flight‘ response, but how much more of our behaviour is influenced by such factors? The mammalian diving reflex allows humans, although more prominently in young children and even babies, to hold their breath underwater for long periods of time (compared to above water). When the face feels cold water (below 21 degrees), there is an involuntary physiological response from the body to reduce oxygen consumption as a survival mechanism. The heart slows, blood flow is reduced to the hands and feet and at even greater depths the lungs are allowed to flood to help equalise pressure to increase survival. Recent footage released of chimps exhibiting what is described as ‘bizarre behaviour’ (throwing rocks at trees), have been used to attempt to explain ritualistic behaviour in early humans that may have developed into religious activity. “This represents the first record of repeated observations of individual chimpanzees exhibiting stone tool use for a purpose other than extractive foraging at what appear to be targeted trees,” the researchers write in their abstract. “The ritualised behavioural display and collection of artefacts at particular locations observed in chimpanzee accumulative stone throwing may have implications for the inferences that can be drawn from archaeological stone assemblages and the origins of ritual sites. Desmond Morris explored questions regarding the evolutionary aspects of humanity and more in his books and documentaries spanning the last decades of the twentieth century. The evolution of the human brain. Le Page, Michael. “The ancestor within.” New Scientist. 1/13/2007. Vol. 193 Issue 2586, p 28-33. However lying, deception, untruthful, false, dishonest, mendacious, perfidious, duplicitous, dissimulating, dissembling and double Janus-facedness is a normal human behaviour, not just human, animals deceive too. Koko the Gorilla had been taught sign language and ruthlessly blamed the ripping out of a sink from a wall on her pet kitten (Koko signed on the return of her keepers…..”The cat did it!”). If we are to take an evolutionary view it is a survival mechanism, a simple smile to someone you despise or you feel threatened by is a useful tactic to hide any weaknesses that may be exploited by them and hide, deceive them of your true feelings. However false smiles can be detected if you know where to look – the muscles that generate a warm and honest smile are different to those that are created when creating a false smile. It’s all in the eyes…you see. And there lies the crux of the matter…are there any reliable physical cues to deceptio n? Maybe a more fundamental question is are there any universal responses of facial expression or body language? (The eyebrow flash for recognition of someone is thought to be pretty universal as an involuntary response.) Certainly classic research by Ekman into facial expression has suggested that there are a handful of truly universal expressions. However deceivingly there is a long tradition of supposed cues to deception or ‘tells’ as gamblers would say little unconscious signs of anxiety, uncertainty due to knowingly attempting to convince someone of something you know not to be true. Going red, not being able to look someone in the eye, looking at someone for too long in the eye, rubbing the back of the neck, rubbing the ear lobes, scratching the nose, excessive blinking (note that psychopaths reportedly blink less and maybe that is why they are better at deceiving people) are all ways many think they can spot a liar – but where does the truth lie? F.B.I training focusses upon a range of techniques for detection . Where humans on average can detect lies at marginally above chance level – 54% but surely professionals such as Police officers are better? 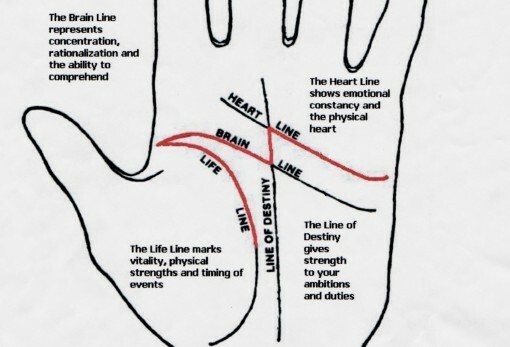 When Samantha Mann conducted research into a new area of lie detection and found some interesting results, there seemed to be a greater emphasis on story cues rather than the historic notion body language cues of the more experienced and stronger lie detectors used in the research. Detecting true lies; Police officers abilities to detect true lies. Mann and Vrij’s research supports the view that often the focus on lie detection is in behavioural cues rather than the more accurate experienced police officers who also rely on story cues as a method of detection. There have been a number of publications integrating a range of approaches to lie detection. Here is an overview of an alternative piece of research conducted by Mann and Vrij investigating high stake liars. Professor David Canter and colleague Dr John Synnott may be about to turn the whole area on its head with current research taking place at the Centre for Investigative Psychology on revisiting the use of polygraph techniques in the UK. The BBC recently compiled a practical overview of lie detection – View it here. However, the detection of lies can be fun……………..in a light entertainment kind of way. The story cues on the clip below may seem so far fetched that it must be a lie…it must be………..mustn’t it? Freewill Vs Determinism; irrational decision making…..how a warm drink can manipulate your thoughts and other priming influences. In the previous post, a link was created to provide some information on the cognitive bias- how are thoughts tend to be irrational and not based upon cost/benefit analysis as some cognitive models hypothesise. How rational are humans? To what extent do we choose our destiny or more importantly to what extent can our behaviour be influenced by unconscious ‘nudges’, that makes it seem like we chose something when in fact we didn’t – how do you even measure such an effect? Showmen like Derren Brown use this grey area to provide simple but high impact effects such as priming. The following BBC documentary shows how the science of decision-making shows us free will is something more scarce than most of us think. 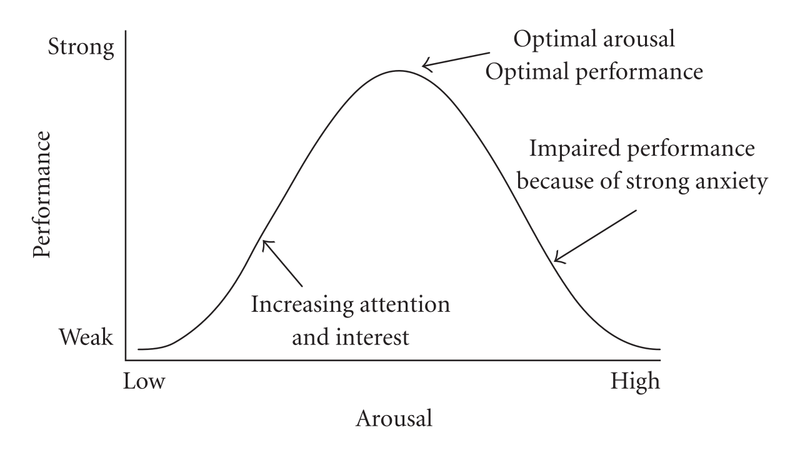 Freewill Vs Biological Determinism; The benefits of choosing positive stress perception…..
As shown above the classic Yerkes Dodson inverted ‘U’ illustration of the relationship between anxiety and performance used in sport and a range of other areas of applied psychology -the right amount of stress at the right time can aid performance. However, if you were to ask most people about their stress levels – you will get a consistent answer regarding there being too much of it, which is difficult to argue with. Or is it? Below is a lecture that discusses how the choice of perceiving the stress response in a psychologically healthy way has the significant influence of the body effectively following suit and minimising the physiological symptoms of stress including premature death. These are significant claims – watch the video and examine the evidence presented, is it as simple as changing your mind? If so the freewill debate just received some long needed support……….As 90’s band En Vogue sang ‘Free your mind and the rest will follow‘ maybe they were onto something. Female serial killers……there are more than you think! A recent article by the British Psychological Society research blog has highlighted the sudden rise, 150% since 1975, of Female serial killers with hedonistic (financial, lust) reasons cited as a strong motivational factor as well as power seeking. 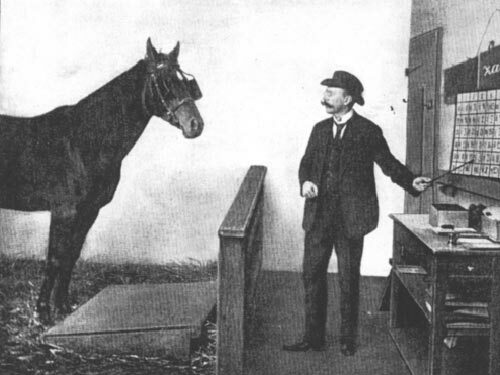 The Clever Hans effect is wonderful example of how important it is for psychological research to be double blind if it is to truly minimise any bias from researcher or participant. The story goes the horse – Hans was taught Maths everyday for two years was able to tap out with his hoof the answer to difficult mathematical sums (by reading them first equally as outstanding!). Hans was paraded around Europe as an example of animal intelligence………..when in fact Hans was only tapping his hoof after noticing small changes in his trainers (Van Ousten) body language before receiving a stick of carrot and therefore receiving an unconsciously transmitted signal from his trainer. In research methodology this is commonly referred to as the observer-expectancy effect. 2D:4D Ratio…….Counting examples of biological determinism on one hand. Contemporary research has focussed on some links between finger length and correlations between a range of variables such as sporting prowess. Have a watch of the video below from The New Scientist…..do you agree with the conclusions drawn or is it just science getting out of hand? Prof Philip Zimbardo produced one of the most compelling, insightful and unethical pieces of psychological research with the Stanford Prison Experiment. Zimbardo manipulated the everyday roles that people play to prove an important point..the good people can do bad things. I have been lucky to meet Prof Zimbardo on a number of occasions and he is truly one of the most compelling story tellers especially for a man of his age. Click on the picture below to hear Zimbardo speak about the psychology of evil…before you do take a closer look at the image…..(beware the video is quite a graphic as is the nature of his presentation).